It’s mid-August, and before you know it school will be back in session. Each summer, I take my kids on a few special outings… trips to see friends and family, afternoons at the movies or the splash park, and more. Last summer, I took my daughter to her very first concert – Family Channel’s Big Ticket Concert – and she had a blast! It was so much fun that the day after the concert she asked, “Can we go again next summer?”. Well, it’s that time of year again, and I’m here to give you all the details! In a nutshell, the Big Ticket Concert is a family-friendly event for all ages. Its early start time (6 pm) ensures that even the youngest Family Channel fans can enjoy the music, dancing and fun atmosphere! 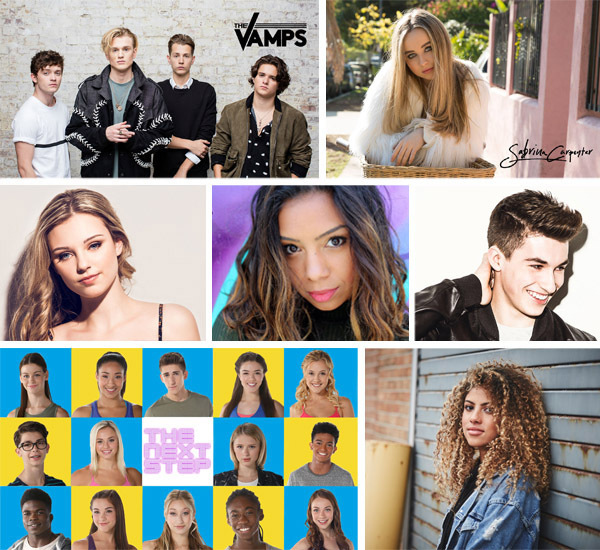 Headlined by British pop band The Vamps (shown below, top left), this year’s lineup includes fan favourites Sabrina Carpenter from Girl Meets World (top right); Mckenzie Small (bottom right), Josh Bogert (middle row, right) and Aviva (middle row, left) from Backstage; and dancers from The Next Step (bottom left) – including the first-ever live vocal performance by Taveeta (middle row, centre). This year, I may surprise my kids with a special VIP backstage experience, too. (Shhh… don’t tell them!) For the first time ever, you can get a special add-on featuring a meet & greet with the show’s performers. What a way to get up close and personal with their favourite Family Channel personalities! Hurry and get your very own tickets at LiveNation.com and check out Family.ca for more information about the event! Tickets start at $20, so they’re super affordable!! I’ll be sharing updates from the concert on August 27th, so be sure to follow me on social media (@fabfrugalmama). My family is looking forward to making summer memories at this year’s Big Ticket Concert! Will we see you there? Disclosure: I was given tickets in exchange for this post. As always, I only share things I love with my readers. What a fantastic event! Such a great way to end the summer with a fun family event everyone will love!